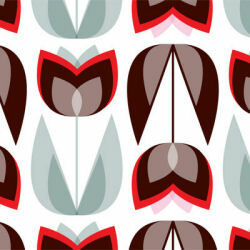 We’ve featured ISAK’s retro tableware before, but did you know that they also do wallpaper? ISAK’s wallpaper is custom-made to fit your wall. You pick the design you like from a choice of five, send ISAK the measurements of your wall and in a few weeks you’ll receive your very own rolls of wallpaper. Apple, Daisy and Tulip (picture here) are bold retro patterns, and Birds and Owls are quirkier typically Scandinavian illustrations, perhaps more suitable for a child’s room. The wallpaper costs £20 per square metre and can be ordered from the ISAK website.